For the purposes of this demo which is based on the subway scenario, there is a SmartcardService that reads smartcards. 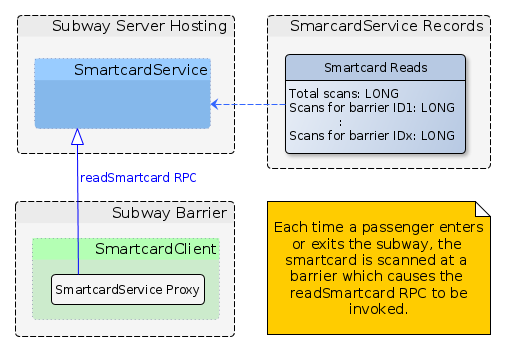 It does this via an RPC that is initiated from a SmartcardClient, the app running on the barrier that scans your smartcard when you enter and exit the subway. The SmartcardService publishes a record that contains a the number of smartcard reads per barrier and in total. Here a PlatformKernel is started, this has the Registry and the ConfigService. The PlatformDesktop is used to show how the system is behaving. The PlatformDesktop is part of the tooling that comes with ClearConnect, it provides a transparent view of ClearConnect services and clients for development and support.